Oxford University researcher Dr Lucy King started a project in 2007 born out of local knowledge that suggested African elephants are scared of honey bees. Dr King carried out scientific studies using playback experiments where honey bee recordings are played to unsuspecting elephants. Remarkable video footage shows a herd of relaxed elephants promptly retreating when they hear the sound of bees. African honey bees are highly aggressive says Dr King, and although elephants have a thick skin, she believes they are prone to being stung behind their ears, on their eyes, and up their trunk. Local people tell of an elephant’s extreme pain after disturbing a beehive in a tree. Matriarchs seem to have passed this knowledge down through generations, says King, making their retreat behaviour a reliable outcome from bee encounters. Led by Dr King, the award-winning Elephants and Bees Research Project, a collaboration between Save the Elephants, Oxford University and Disney’s Animal Kingdom, was set up to tackle the human-elephant conflict. Even with the international ivory trade ban by CITES in 1989, underfunding of wildlife management and protection has led to elephant population depletion in some African countries. Save the Elephants reports that 100,000 elephants in Africa were killed for their ivory between 2010 and 2012. Elephants are being poached at a rate that could see species extinction within a couple of decades. Yet in some Eastern and Southern African countries that have improved their wildlife protection and management, elephant numbers have been rising. However, these countries are also experiencing rising human populations, and human settlements are encroaching on elephant habitat. Elephant habitat is becoming fragmented as elephant populations are separated by human developments. According to the World Wide Fund for Nature (WWF), habitat loss and degradation is expected to become the biggest threat to elephants. Previously unfarmed land, including woodland, is being cleared for agriculture or infrastructure. As populations increase in some protected national parks, it isn’t possible to contain elephants as they search for food beyond park boundaries. Elephants are finding their old migratory routes interrupted by human settlements. As elephants and humans compete for food and water, conflict occurs with devastating consequences. While people worldwide revere elephants, local people often live in fear of losing their livelihood or their life. WWF reports 200 people were killed in Kenya over the last seven years. Kenyan wildlife authorities shoot between 50 and 120 problem elephants each year. Crops are an easy and readily available food source. The African bush elephant is the largest land animal on the planet, able to consume over 300 kg of food per day. In one single night, a hungry herd can eat their way through a farmer’s entire crop, leaving them with no income, no food to feed their family and no seeds to plant next year. Elephants usually raid crops at night, making it difficult for farmers sleeping close by to scare them away. Elephants are intelligent animals and have become accustomed to traditional methods of warning them off such as beating drums, clapping, and lighting fires. Elephants will even fill in trenches dug around the crops to keep them out. In a human-elephant encounter, elephants, as well as people, can be injured, sometimes fatally. The Elephants and Bees Project reports that wounded elephants in pain can become aggressive, and a herd death can result in the future aggressive behaviour of elephants towards humans. 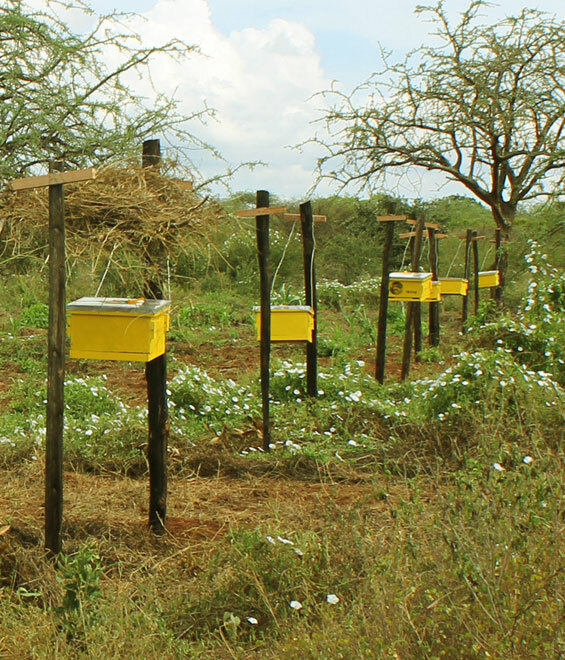 Beehive fencing offers a solution that empowers small-scale farmers. In 2010, Dr King presented her PhD thesis on “the interaction between the African elephant (Loxodonta africana africana) and the African honeybee (Apis mellifera scutellata) and its potential application as an elephant deterrent” to Oxford University. Where electric fencing is too costly for small farms, beehive fencing is sustainable as well as financially viable. The fencing comprises a wooden beehive hanging between two wooden poles, protected from the sun by grass thatch, linked by wire to further beehives. This system extends around the farmland being protected. If the wire is knocked, the attached beehives move, disturbing the honey bees. Infrared video footage by BBC2 in Natural World – Queen of the Savannah shows a hungry herd approaching a protected area at night, coming very close to the boundary protected by a beehive fence. The elephants can sense the bees and turn away, leaving the crops intact. The Elephants and Bees Project is now based at Sagalla in Kenya, next to Tsavo East national park. The number of local farmers with beehive fences has expanded from two in 2009 to fourteen in 2014. A training centre has been set up to help other Kenyan farmers, as well as a honey processing room. The beehive fence not only helps to protect crops, but it provides an extra source of income for the farmer – the honey is sold as ‘Elephant-friendly honey’. Dr King and her team have also assisted beehive fence projects in Mozambique, Botswana, Tanzania, and Uganda. In Mozambique, the design has been adapted so that shredded rubber tyres replace the wire to prevent poaching snares being made from beehive fence materials. Beehive fencing offers a win-win solution that protects a farmer’s livelihood and family, as well as protecting elephants from harm. It is a compassionate solution to the conflict caused by rising elephant and human populations in some areas. But the problem of decreasing elephant habitat and reduced food sources remains, and the human-elephant conflict is potentially shifted to the next farm without protection. Save the Elephants reports that Africa’s human population will double by 2050. Increased education and availability of contraception can help to control human populations to ease the demand for natural resources and the competition with wildlife. In the meantime, let’s celebrate environmentally friendly solutions that involve the local community, such as the innovative beehive fence.